The 1950s comics scene was dominated by horror and crime comics, or witch hunts and scare stories, and was characterized by long-established comic-book companies going under. Into this unpromising environment Joe Simon and Jack Kirby launched Fighting American in 1954 (published by Prize Comics), which the creative duo hailed as the first superhero satire in comics history. Interestingly, Marvel Comics had revived Captain America just eight months earlier, and it is intriguing to ponder if Simon and Kirby created the Fighting American as a riposte to their earlier superhero creation. Indeed, the pair’s avowed aim was to make the public forget Captain America entirely; clearly, this did not happen. The first issue of Fighting American introduced readers to patriotic television newscaster Johnny Flagg, a war hero much given to warning America about the dangers of communism. Those self-same communist agitators promptly beat him close to death, but on his deathbed he asks his feeble brother Nelson (who had been scripting Johnny’s red-baiting speeches all along) to carry on his fight. Days later, the army summons Nelson to a secret lab where Johnny’s revitalized body has been dressed in a stylish red, white, and blue costume. In the ensuing operation, Nelson’s brain is transferred to Johnny’s body and the fearless Fighting American is born; what happened to Nelson’s body is never revealed (and Nelson himself does not refer to the event again). 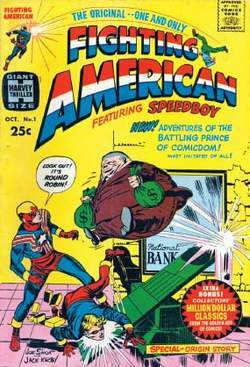 Just as Captain America had a sidekick, the Fighting American soon acquired his own young assistant, Speedboy, a young pageboy who stum bled across Johnny/Nelson’s secret identity and was instantly recruited to the cause. Again, like Captain America’s 1950s adventures, the Fighting American was rabidly anticommunist, although Simon and Kirby played it all strictly for laughs. Indeed, there has never been a stranger collection of bizarre villains in comics history. Among the varied villains on display, the unsuspecting reader could come across the likes of Invisible Irving, Double Header (who, of course, had two heads), Hotsky Trotsky, Poison Ivan, Count Yuscha Liffso, Superkhakalovitch, and Square Hair Malloy. Not content with outlandish bad guys, the strip also featured weird guest stars like Uncle Samurai, Shiskabob the Sorcerer, and Yafata’s Moustache, along with a bevy of buxom femme fatales, including Charity Bizarre, Scarlet O’Haircut, and Lucy Liverwurst. Simon and Kirby were long-established comics pros but their roots were in the unsophisticated, hard-living slums of New York and the comic reflected this environment. The humor was broad, slapstick comedy, full of joke Yiddish names, ethnic stereotypes, and resolute political incorrectness. In spite of (or because of) this, the feature was genuinely funny. However, the mid-1950s were not a good time for superheroes, and Fighting American lasted a mere seven issues. Eleven years later (in 1966), Simon revived the comic during his short-lived stint as an editor at Harvey Comics; this comic combined reprints with strips intended for the old, unpublished eighth issue. Harvey pulled the plug on its super-heroes with only one issue released, even though a second issue was ready for printing, but Simon retained his copyright on the character, waiting for the right moment to unleash his hero again. After a long wait, the character returned in 1989, in a deluxe hardback compilation of his 1950s strips, issued by Marvel Comics. This heralded a decade of bizarre miniseries. The first of these, published by DC Comics in 1994, retold the character’s origin story but updated it to the present day, dumping the treacherous commies but keeping the strange villains (such as the Media Circus and the Gross National Product). The Fighting American’s next outing had as convoluted an origin as any comic of recent years. In the mid-1990s, Marvel revamped a host of its comics in a campaign called “Heroes Reborn.” One of these—Captain America—was produced by the controversial Rob Liefeld. The Heroes Reborn line was jettisoned after a year, but Liefeld had already drawn some more issues that he was determined to use, and so he made some art changes, renamed the hero Agent America, and prepared to release it under his own company, Awesome Entertainment. Marvel immediately sued over the blatant similarities to its legendary Captain America, but Liefeld countered by licensing the Fighting American from Joe Simon, changing his leading characters (again), and redrawing the Nazis as communists. Such was the fervor for superheroes at the time that the Fighting American miniseries (in 1997) led to two further outings over the next couple of years. Neither added much to the hero’s reputation, but the idea that new Fighting American stories came out of old Captain America strips was deliciously ironic. Trump in a tweet in early January has accused Pakistan of playing a "double game" and providing sanctuaries to Taliban factions fighting American troops in neighboring Afghanistan. Another of Kirby's and Simon's creations will return in October when Titan Comics publishes the first issue of Fighting American, another patriotic hero " though this one with a satirical bent. The BBC intends to spend around $44 million fighting American media and tech giants 6 namely Amazon, Netflix and Facebook 6 in what the British broadcaster's leadership is calling a "rallying cry" to recapture Britain's youth. Jose Torres Bugallon, who was felled by a bullet while fighting American soldiers in La Loma on Feb.
A World-War-II fighting American icon whose sidekick has been killed, so he gets another one, who then helps him re-kill the original sidekick who has been turned into a zombie by people who are . Tonight, Dodson watches former opponent Carl Froch bid to become the world's best super-middleweight when fighting American Andre Ward. It is no secret that the parties that played a major role in fighting American forces are now preparing to put their battle under the slogan of 'terminating the Iranian influence. Fighting American is published with perfect timing as the new Captain America: The First Avenger film comes on the market, and comes from the team behind the original Captain America. The statement charged "the groups behind those attacks, who claim that they are fighting American troops, but they know that they are threatening nobody, but innocent Iraqis, along with important buildings, such as the Basra International Airport, considered one of the important economic installations of Basra Province and the whole of southern Iraq. Western officials have long accused Pakistan s intelligence services of playing a double game by fighting Islamist militants who pose a domestic threat, but protecting those fighting American troops in Afghanistan. Summary: The Pakistani Taliban welcomed on Sunday the new government's readiness to negotiate an end to a spreading conflict in Pakistan, but vowed to carry on fighting American forces in neighboring Afghanistan. THE story of British boxers fighting American champions in America is not one of universal success.